"This release is a successful, moody and inspired conceptual, almost cinematic, musical exploration, digging into associations and ideas from ‘The Wheel Of Life’, presented musically like a world with an essence of exotic and magical mystery. Just listen to the successful craft of electric guitar on “Akusala-Mula” with bass, moody keyboards, played with an underlying power, followed by a moody piano ambient track, "Intermediate State". This is followed by 6 parts/tracks representing the 6 worlds of experience according to the Vedas (the world of Devas or Gods, Titans, Hungry Ghosts, Hell creatures, Animals and Humans). The 'Deva world' is presented by eastern folk music played with Chinese instruments and dulcimer. The ‘titans’ are present in a new World Fusion style, with its own magic of sounds and rhythms, with a frightening underlying power, still presented with a relaxing calmness of unattachedness. Also the ‘hungry ghosts’ are colourfully presented with the right instruments and effects. The ‘hell world’ is presented with dark ambient drones, not sounding too different from the ‘animal world’, which sound except with a similar frightening magical tension, also sad with additional flute playing. The 'human world' continues with the flute, and has some beautiful solo singing from Vietnam, a Buddhist prayer, with three guitar notes repeating and spinning around the sphere. Most of the tracks hereafter continue the musical theme and sphere described in the human condition, and also shows these human conditions in which you can be born; if one incarnates into that last realm, a choice which is hopeful, but still is built by restrictions that must show the condition of being incomplete, before a person understands and decides to take an outwards evolution, after realising all the elements of incompleteness. First we can hear sad drones with Chinese flute (ignorance), a complex continuum drone with melody (karmic formations), something which isn’t changing to something more hopeful, but only gets more description and flavours through the following tracks (presenting the elements of consciousness, naming and taking form, six senses, contact, feelings, craving, grasping/desire, becoming, birth, decay and death), presenting the underlying growth of one’s consciousness within the wheel of life, and from birth into rebirth. All the realisations of its consisting elements, all with its specific formal results, have all the same practical result which can make a purpose for a person when realizing how everything has an inevitable nature, in its whole presented, to end one day or another (Lord of Death), or to see its true nature of what things really are, and some time are not, as the essence of being or not-being (Buddha of Infinite Light). “The six senses” were of course presented with more aesthetic brightness (sitar, guitar, tabla, keyboards, and improvised vocals). The other tracks enfold, with various different elements (piano, flute and keyboards, electric guitar, Indian voice,..), of how attractive it can become in becoming someone in this world, which can form a reason, according to the Buddhist beliefs, of how people finally are reborn into the human state. The result in life itself will become once more of how all attractive elements will show their limited states. The ‘decay and death’ part has almost industrial rhythms and keyboards, with a magical, dark tension. But also the closing sections, after ‘death’, presenting the Buddhic realms have a different, melodic attractiveness. When considering an artist and his vision to look at the different realms, one can realize how much all creative forces can come from the same source of inspiration. The CD is truly successful, and is a musical spiritual journey with a powerful expression. It should also interest people interested in Buddhist, Jain or Hindu ideas, looking for an honest creative exploration of their ideas into a musical form. The music works as a deeper interconnected meditation into the subject, and is the opposite of most vaguely self-fulfilling New Age products." “"Bhavachakra" is a great instrumental prog album with many influences. Not strictly 'rock' music, but neither is this something that in years past would have been labeled 'new age'. The third release under his own name this is certainly Gino's nod to Indian culture (but also incorporating Middle Eastern & even Brazilian influences) while still retaining the elements of his first two CDs that will appeal to prog rock and fusion fans. In fact a lot of this reminds me of some of Michael Manring's work - beautiful melodies played in a semi-classical style with some very distinctive bass work! 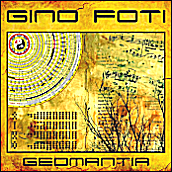 If you enjoy lush instrumental prog informed by world musics then Gino's CDs are definitely right up your alley!" "Bhavachakra offers introspective raga-rock, moody Harold Budd-like piano nodules, simple sitar and tabla workouts, and swelling synth choruses, all drenched in humid reverb." "Playing world music fusion demands understanding and respect of the cultures involved in the creational process. Capturing the essence of the various musical heritages, is another challenge. And here comes Gino Foti! He is one of the rare musicians whose sensitivity to spiritual and magical is mixed with unparalleled musical skills. His profound understanding of cultures and world's main philosophies is embedded in his compositions rewarding the listener with an amazing palette of melodies, sounds and rhythms." There are four movements to Gino Foti's Bhavachakra, with the first and last movements being relatively short, while the middle two have shorter thematic arcs that run within the larger movement. This is by design as Foti uses modern instruments with the structuring of classical music. There is a range in intensity, from almost overwhelming at some points, to relaxing at others. There is a dark transition in "Akusala-Mula (The Three Poisons)," which builds as the piece progresses. The movement slides into "Sidpa Bardo (Intermediate State)," which leaves you in the space between. The first dance comes in gracefully as "Devas (Gods)" swirls and undulates to its steps. The next dance comes in rawer as "Asuras (Titans)" moves to a larger scope of movement. You can feel an almost constantly shifting movement in "Pretas (Hungry Ghosts)" driven by a harsh hunger. The music becomes stranger still in "Narakas (Hell Beings)," the guitar bringing in a darker and deeper hunger. The wildness of "Tiryakas (Animals)" lets you breathe a bit as it echoes, in places, animals in the wild. The music returns to dance again in "Manushyas (Humans)" as the movement started in the first dance is brought to a close. There is a simplicity and beauty in the melody of "Avijja (Ignorance)" that almost runs counter to its title; contrasting with "Sankhara (Karmic Formations)" quite starkly. The notes of "Vinnana (Consciousness)" stretch out, bringing calm. The music becomes denser as it builds in "Nama-Rupa (Name & Form)" and there is a sense of something coming into being. There is so much in the opening of "Salayatana (Six Sense Spheres)" that the music and its imagery can overwhelm. The piano opens "Phassa (Contact)." The music is exploratory, reaching for something new. It is the flute that holds the melody of "Vedana (Feeling)." A moment's pause comes before the pulsing intro of "Tanha (Craving)" -- the electric guitars slowly raise the intensity of this piece. The arc that began in "Vedana" continues through into "Upadana (Grasping)" as the hunger in the music reaches a climax. Themes from early in the third movement return in "Bhava (Becoming)," moving past the hunger through a state of transition. You get a very romantic image of birth in "Jati (Birth)" from the soaring lines of the melody. "Jara-Marana (Decay & Death)" is upbeat, which fits within the cycle, though it turns graver toward the end of the piece. The last movement builds on the last notes of "Jara-Marana" as "Yama Raja (Lord of Death)" drifts on relentlessly. It is the piano that brings the themes to a close in "Amitabha (Buddha of Infinite Light)" and the music releases the listener.